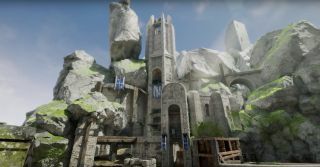 Unreal Tournament developer Epic Games has released the last of a trio of behind-the-scenes videos showcasing the work that goes into creating a level for the upcoming free-to-play FPS. The first video, which was actually put up in September, demonstrates the early stages of the creation of CTF Outside, the working name for the map that's now officially known as Titan Pass. The map at this stage is a very basic "shell," with a simple color scheme and no art assets attached. The second video, from October, sees it become more of a fully-realized level, as concept art is translated into an actual in-game look with proper textures, lighting, and a focus on the balance between detail and playability. The third video is all about the process of testing and tweaking to make sure that everything works like it's supposed to. It's clearly a very involved and detail-oriented process, and it demands attention to things that I, as a non-developer, would not have considered. One thing that seems obvious in hindsight is the need to ensure that the map's dimensions remain the same after all the bric-a-brac is applied, and that the map doesn't feel "tighter and more claustrophobic" as the various layers are added. "We're definitely not done with it," Senior Level Designer Sidney Rauchberger explains. "Since we're a 'living project,' there are a ton of things that we still want to touch up on and improve. It's an evolving process." The new Unreal Tournament is still in pre-alpha but it's playable and, as long as you don't mind that it's far from complete, a pretty good bit of fun. And it's free, which is a pretty big plus. Grab it at UnrealTournament.com.